I was there when the comeback began! I joined Apple way back in June 1996. Apple wasn't doing very well, and was posting regular losses. We had a new CEO Gil Amelio who was trying to turn things around. To make people believe he was doing a good job, he cooked the books and made a fake quarterly profit of $25 million. 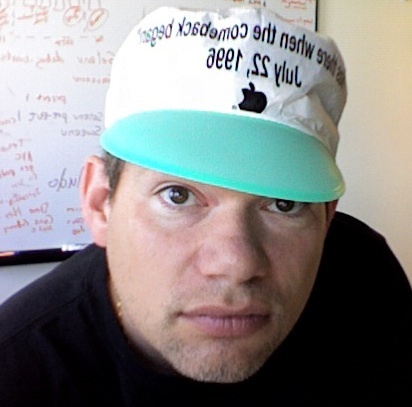 He made a bunch of cheap hats and bumper stickers and handed them out at a company-wide meeting on July 22, 1996. They said, "I was there when the comeback began! July 22, 1996"
In reality, the comeback had not yet begun, and Gil Amelio would not be around when the comeback would eventually begin. I think we announced a $750 million loss the next quarter. Every year on July 22, I dig out my hat and wear it as a homage - a mocking homage - to Gil. Ummmm your image is flipped. Or were the hats so cheap they printed them backwards? This is a bug in Safari. Try looking at it in Firefox or IE. I wrote up a bug. The hat is printed correctly, but Photo Booth does this mirror thing which makes everything look backwards. The hat predates the invention on bondi blue by a couple years. It's just an ugly green hat.